I am offering you the opportunity to start a second business and to help us pass on this amazing internal art by becoming a certified Jiulong Baguazhang instructor. 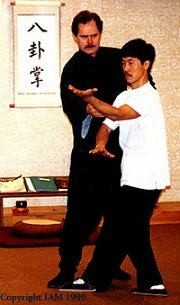 We will help you learn this art, then how to teach others and to start and run your own Nine Dragon Baguazhang School. You will have the opportunity to open and teach classes in health spa’s, holistic centers and clinics in your home town bringing the fantastic longevity, healing, health benefits and martial capabilities to hundreds of eager students as well as making a second income. The beauty of the Jiulong Baguazhang system is that it is an ideal exercise for mind body and spirit for students from 18 to 80. You can teach our basic curriculum to a mixed group of students of all ages and physical conditions and everyone will benefit at the level of their personal needs. You can also cater specific programs for students interested in martial art abilities, physical fitness or use our Qigong for health enrichment. This is a once in a lifetime opportunity to be part of the fastest growing internal martial art in the world with over 30,000 students and many schools world wide. This program will be offered to only a select few applicants. We will teach you every aspect of this amazing internal art. We will also show you how to market and run your own Jiulong Baguazhang School. Your basic training in Jiulong Baguazhang is called Dragon Rolling The Pearl with this you will discover the real secrets of internal power as well as practical methods of health and longevity development. Email us and let us know you are interested in the instructors program. We will work with you to see if this is really what you want to do. Then we will set up a time schedule for you to come and train with us at The Gompa Center in Arlington Texas. You will begin by learning the program called Dragon Rolling the Pearl Basics Course. This will take approximately seven visits spaced out over one to three years and consist of approximately 126 hours of instruction at a very affordable price. For detailed information email Mike Leach Office Mgr. Students of our existing study groups and schools may also apply for an assistant instructors program. We are waiting to hear from you, contact us today! Please only serious inquiries and you must be 18 years or older.